One week after his self-immolation, 22-year old Tibetan monk Tenpa Thargyal succumbed to his injuries and consequently was cremated by Chinese authorities, who refused to hand over the body to his fellow monks. A Tibetan monk has died a week after self-immolating in protest against Chinese rule in troubled Sichuan province, exile sources said Saturday [07 April 2012]. Tenpa Thargyal, 22, died at a hospital where he was admitted following the self-immolation on March 30 in Barkham (in Chinese, Ma'erkang) city in the Ngaba (Aba) Tibetan Autonomous Prefecture, said Kanyag Tsering, a monk in India's hill town Dharamsala. "He died around 9.23 a.m. in a hospital in Ngaba area," Tsering said, adding that Thargyal was cremated by the Chinese authorities who refused to hand over his body to monks from his Gyalrong Tsodun Kirti monastery in Barkham. “When the monks were carrying the remains towards the monastery, the Chinese police and PSB [Public Security Bureau] followed them in three vehicles," he said. "The Tibetans who received his remains were further pressured to put thumb impressions on [documents outlining] several restrictive conditions," he said, without elaborating on the conditions. Chime Palden, 21, another monk who self-immolated with Thargyal, had died a day after the burning. Thirty-three Tibetans have set themselves on fire since 2009 as they stepped up their protests against Beijing's rule and called for the return of the Dalai Lama to Tibet. The latest death brings to 25 the number of self-immolating Tibetans who have succumbed to their burns so far. 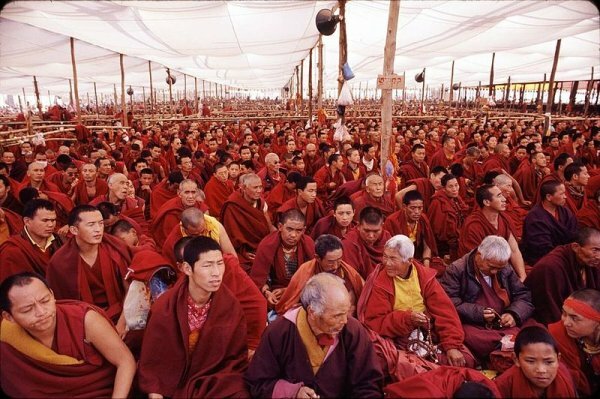 Monks conducted funeral prayers for Thargyal at the Gyalrong Tsodun Kirti monastery on Saturday [07 April 2012]. “A huge contingent of Chinese [security forces] forces are stationed on the other side of the river [across the monastery] and are conducting exercises to intimidate the local Tibetan community.” Tsering said. The self-immolation protests by Tibetans have resulted in a Chinese security clampdown in Sichuan and the other Tibetan-populated provinces of Qinghai and Ganzi, as well as in the Tibet Autonomous Region. Chinese authorities have labeled the self-immolators as terrorists, outcasts, criminals, and mentally ill people, and have blamed Tibet's spiritual leader the Dalai Lama for encouraging the burnings which, they say, run contrary to Buddhist teachings. But the Buddhist leader has made clear he does not encourage the self-immolations, in turn blaming China's "ruthless and illogical" policy towards Tibet for the protests.